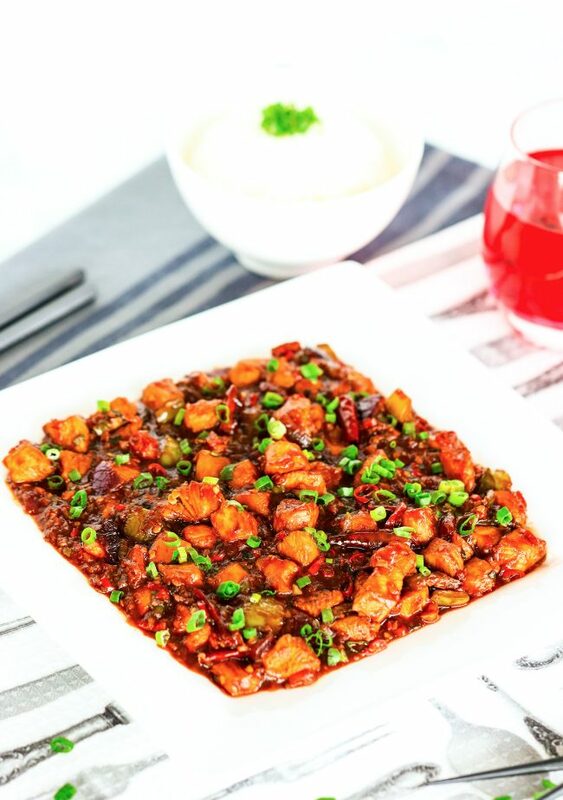 This Lightened-Up Indo-Chinese Chili Chicken is a quick and easy fusion stir-fry dish that packs a punch and is bursting with spicy, slightly tangy, and sweet flavors! 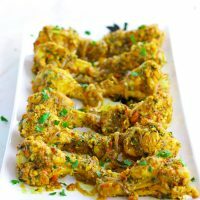 Tender diced chicken pieces are coated in a light marinade, shallow-fried, and then tossed with bell pepper and onion in a garlicky chili sauce! 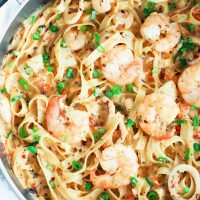 Perfect for a quick weeknight dinner! “What is Chili Chicken?”, I hear you ask. Well, it’s a dish that is from the Indo-Chinese (aka Indian Chinese) cuisine. 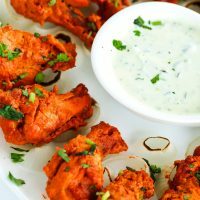 Essentially, Indo-Chinese food takes Chinese cooking techniques and adapts the ingredients to create a dish that appeals to the Indian palate. 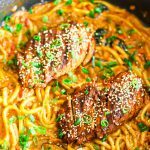 If you haven’t heard of this particular type of fusion food before, let me be the first to tell you that the food that results from blending these two cuisines together is absolutely MAGICAL! 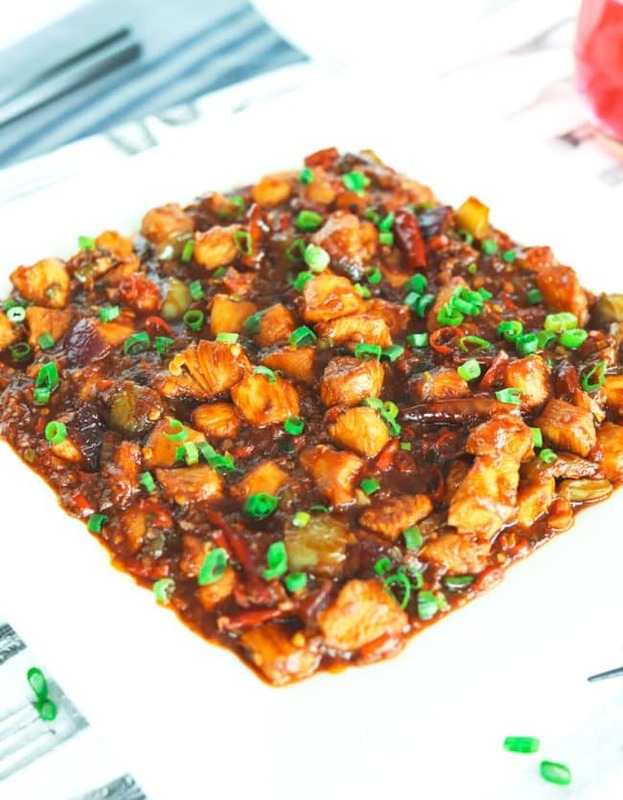 My absolute favorite dish on the menu was the dry version of Chili Chicken – boneless pieces of diced chicken that is marinated, deep fried, then tossed in a delicious spicy and slightly sweet Chinese flavored sauce. 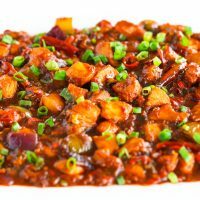 The cooking technique for the dry version is along the same lines as the cooking technique for the General Tso’s Chicken that you get in the States. It’s usually eaten as an appetizer, but you can also get a gravy-based version as a main course dish, which goes well with fried rice. I also have an appetizer/light lunch version of this dish in which I sauté ground chicken instead with the minced garlic, ginger, fresh chilies, bell pepper, and red onion with the sauce and serve it up in lettuce cups. YUM! 😍 It definitely has been a crowd pleaser and trust me when I say you’ll want to check out my Chili Chicken Lettuce Cups too (full recipe coming soon)! But back to this lightened-up version with diced chicken breasts! The ingredients you need to chop up for this stir-fry are pretty basic and can be found at your regular grocery store. However, the chicken marinade and other sauces in this dish may require a trip to your local Asian grocery store or can be purchased online. For the sauce, I use two specialty hot sauces – Encona West Indian Original Hot Pepper Sauce and Mad Dog 357 Hot Sauce. Encona West Indian Original Hot Pepper Sauce tastes similar to Tabasco and is a vinegar based habanero pepper sauce. It’s great with quesadillas, nachos, pastas, and even pizza so definitely try it out if you like your food with a lil’ kick! Otherwise, you can use Tabasco’s Original (for a milder substitute) or Tabasco’s Habanero Pepper Sauce. Mad Dog 357 Hot Sauce is a bit harder to find and I order mine from Hot Sauce World as I’ve only come across it in two Mexican restaurants here in Hong Kong. ✋ Word of caution though: this sauce is extremely hot and it is also optional in this recipe if you don’t like much heat. It ranks at 357,000 units on the Scoville Scale so do consider your tolerance level for spicy food before deciding to use it. I personally feel that while a drop or two paired with Mexican food or barbecued meat is hot, it’s still pretty enjoyable. And I like to cook with it too as it delivers a get fruity and smoky-spicy flavor in dishes! In this recipe, I don’t recommend more than ¼ teaspoon if using. 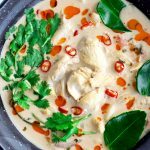 This Chili Chicken dish truly packs a punch and the aroma from this dish actually makes my mouth water. I hold it on the same pedestal level as my Spicy Kung Pao Chicken recipe and cook it 4-6 times a month. That’s saying something for someone who seldom eats leftovers and rarely eats the same thing for dinner twice in the same week (well, unless it’s pasta or fried rice)! 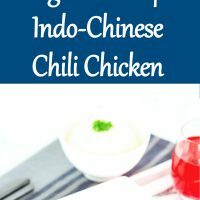 This Chili Chicken goes great with a simple fried rice (with or without egg) or plain steamed white rice. CAN I ADD MORE VEGGIES PLEASE? Yes! 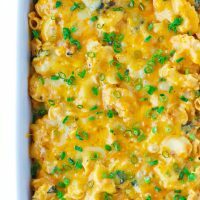 You can definitely make it your own and add other vegetables like diced carrots, corn kernels, and cauliflower or broccoli florets. Oooh, just think of all the pretty colors! 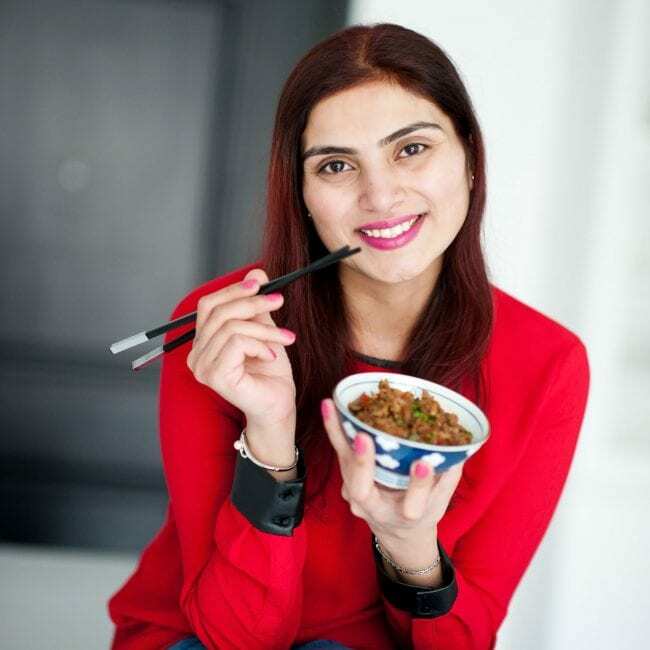 For a vegetarian variation, you can substitute with pan-fried tofu cubes seasoned with black pepper and salt or paneer cubes (Indian cottage cheese). 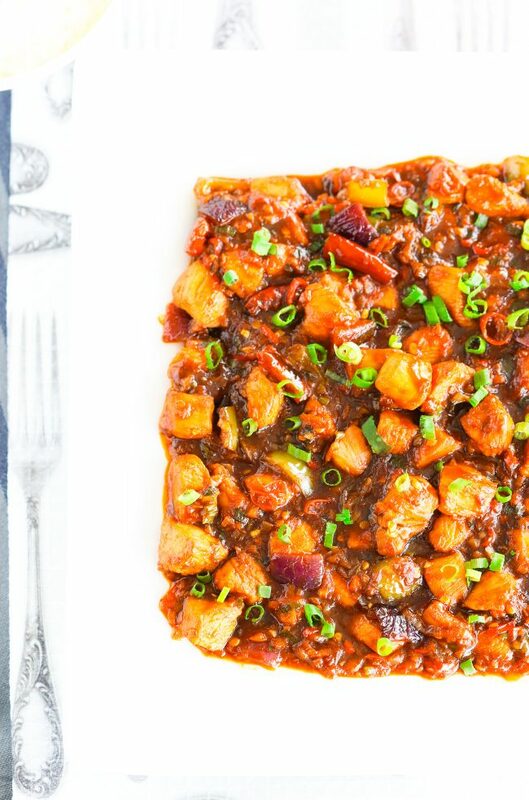 I’ll actually be sharing another one of my favorites from this genius cuisine soon – Chili Paneer with Mixed Vegetables in Gravy – so stay tuned! 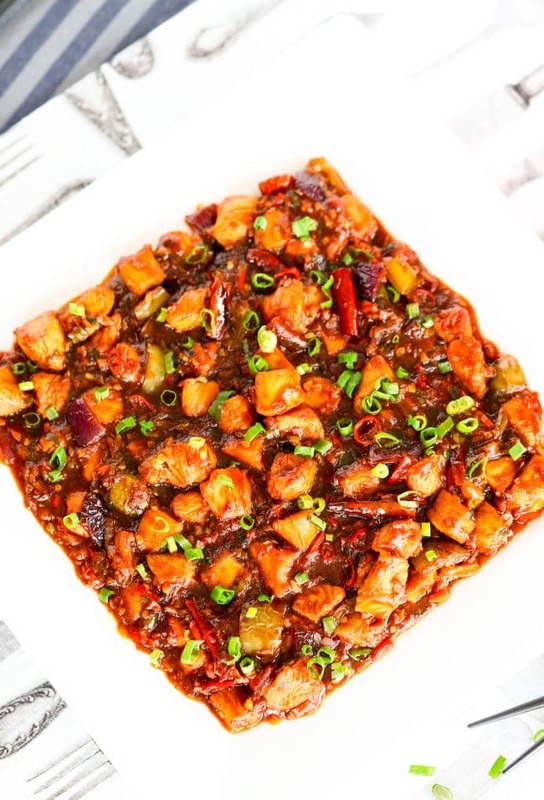 This Lightened-Up Indo-Chinese Chili Chicken is a quick and easy fusion stir-fry dish that packs a punch and is bursting with spicy, slightly tangy, and sweet flavors! Tender diced chicken pieces are coated in a light marinade, fried, and then tossed with bell pepper and onion in a garlicky chili sauce! Perfect for a quick weeknight dinner! Chicken Marinade: Mix together the corn starch, low sodium light soy sauce, Shao Xing rice wine, a dash of sesame oil in a large bowl. Add the diced chicken and mix to coat them well with the marinade. Set aside to marinate while you prepare the other items. Sauce Bowl: In a medium bowl, add all the ingredients for your Sauce bowl and mix thoroughly to combine. Set aside. Prep for Thai Dried Red Chilies: Heat the wok on the stove – about 20-30 seconds. Add about 3 tablespoons of peanut oil to the wok (you will use this same oil later to semi-fry the chicken). Lift the wok and swirl it in a circular motion so that the oil spreads around the perimeter and then place it back on the stove to let it heat up. Add the dried red chilies and gently stir them around the wok until they get slightly crispy – about 10-20 seconds. Be careful not to burn them! Remove them to a strainer and hold the strainer above the wok to let any oil drain back into it. Empty the chilies into a small bowl. Once they are not too hot to handle, cut each dried red chili up into two or three pieces with cooking scissors (cut the longer ones into three pieces and the shorter ones into two). Prep for Marinated Chicken: Turn on stove again and add a dash of sesame oil to the peanut oil already in the wok. Lift the wok and rotate it in a circular motion again and place it back on the stove to let the oil heat up. Once heated, add the chicken and spread evenly in the work. Let the chicken cook and brown for about 1 minute before starting to toss and flip the pieces. Once they are about three fourths of the way cooked, remove the chicken pieces to the fine mesh strainer and hold above the wok to let the oil drain. (You can gently shake the strainer to speed up the draining process, but be careful not to shake too violently as that’ll cause some of the cornstarch to come off and make the chicken a bit mushy.) Remove the chicken into another clean large bowl and set aside. Discard the oil in the wok and wipe with paper towels. Set back on stove. Turn on the stove and let the wok heat up for 20-30 seconds. Add 1 & ½ TBLS peanut oil, 1 TSP chili oil (if using), and a teaspoon of sesame oil. Once the oil is hot – about 30-40 seconds later, add the green bell pepper and the red onion. Cook for 30 seconds and then add the garlic, ginger, and spring onion whites. Give it a quick stir to prevent the garlic from burning. Add the fresh red and green chilies and continue stir frying for a few seconds. Add the semi cooked diced chicken and the Thai Dried Red Chilies. Toss to combine everything in the wok. Stir the contents of the sauce bowl with a spoon (the corn starch will have clotted up at the bottom of the bowl) and then pour in the sauce in a circular motion to coat as many of the chicken pieces. Stir-fry to combine with everything else in the wok for about 40 seconds. Add 2-3 tablespoons of water. Continue stir-frying. Once the sauce starts to thicken up – after about 30-40 seconds, add ¾ of the spring onion greens and toss to combine for 30 seconds. Turn off the heat and remove to a dish or plate. Garnish with the remainder spring onion greens. Serve with warm steamed white rice. 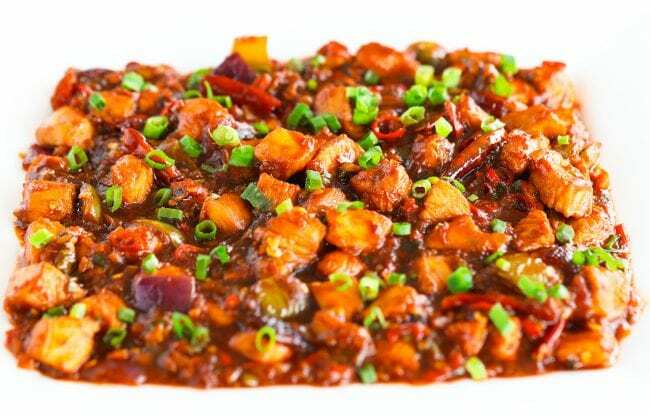 *Deseed the fresh red and green chilies and the Thai Dried Red Chilies if you prefer the dish to be less spicy. **You can usually find Garlic Paste, Ginger Paste, and also Ginger Garlic Paste at an Indian or Asian Grocery Store or try online. If using Ginger Garlic Paste, use 3 teaspoons. If you can’t find either of them, blend equal amounts of roughly chopped garlic and ginger together with 1-2 tablespoons of vegetable/olive oil. 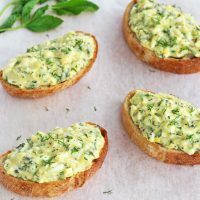 I recommend making a small quantity – ½ cup chopped ginger and ½ cup chopped garlic, as you will only need 3 TSP in total for this recipe. This paste can be stored in the fridge for about a week and used for quick and easy cooking in other recipes such as pasta, noodles, and stir-fries. ***Word of Caution: Mad Dog 357 Hot Sauce is VERY hot so I wouldn’t suggest including this if you are not very big on spicy food. It ranks 357,000 units on the Scoville scale so this one is definitely not for the fainthearted. 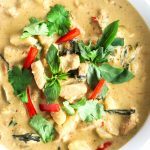 Having said that, if used in the smallest amounts or cooked as I’ve done in this recipe, it gives a fruity and smoky spicy flavor to the food. 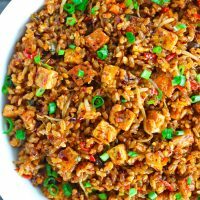 It can be quite delicious in certain dishes, but again, only use it if you know you have a good tolerance for spicy food. Some of my friends and I love a drop or two of this on Mexican food such as chimichangas and nachos! 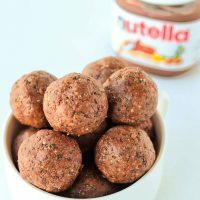 You decide if this is something you would like to include in this recipe, but use with caution and sparingly!